I have had the same pair of identical chain whips for perhaps thirty years. In those days you needed two whips because the Shimano Uniglide cassettes at that time had a small sprocket that screwed in and held the cassette on the freehub body, unlike current Hyperglide cassettes that use a lockring that fits in to a recess in the smallest sprocket. 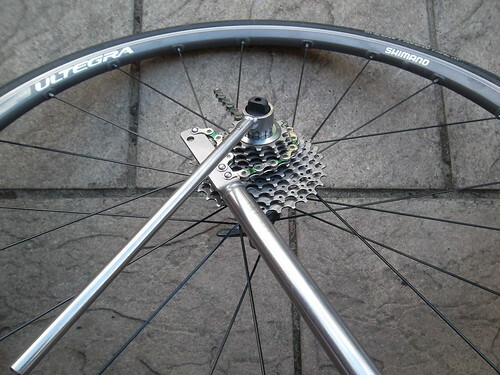 I had been swapping cassettes about between wheels to prolong the life of my best wheelset, and to use a training wheel whenever I used my turbo trainer (turbo trainers require a special tyre that doesn't wear down as quickly as normal tyres). 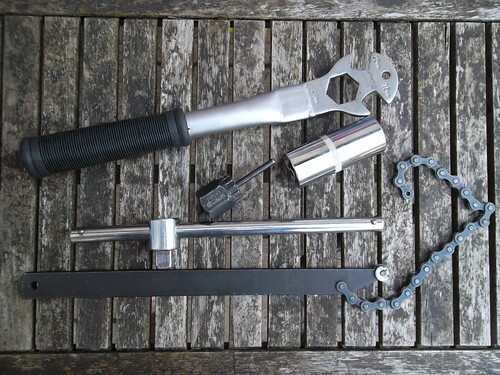 Those old chain whips were designed to work with the six- and seven-speed cassettes that were standard at the time of their manufacture and I had become concerned that my ten-speed cassettes with their narrower spacers were being notched by my elderly tools. And whenever I replace my bike tools I am getting very good ones. So it's a little disappointing to report two negatives that I'll get out of the way immediately. I had assumed that in to the Whip-it handle was inserted a plastic sleeve that held the Crombie securely in place. I was wrong. What is in the end of the handle is in fact a collar – also called a 'plug' – that is perhaps a centimetre long. It fell out. It is a snug fit on the shaft of the Crombie, but doesn't stay in place when inside the hollow handle of the Whip-it. 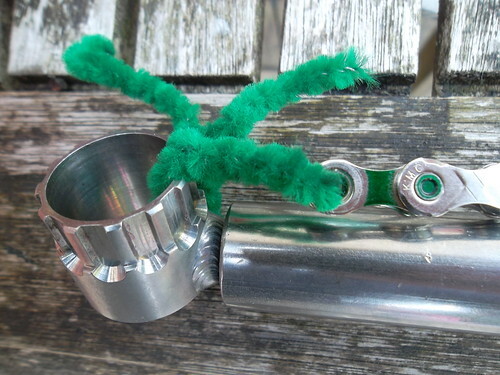 After contemplating what to do – a matching green shoe lace to pass through the last link in the chain, perhaps – I was tidying up my daughter's craft box when I chanced upon a pile of pipe cleaners. Luckily there were a few in Abbey Bike Tools green so this is my current method to stop the tools from slip sliding about the place. Apparently, Jason Quade had experimented with magnets to stop the Crombie falling out, but couldn't come up with a workable solution. I was also slightly disappointed that the 'laser etching' on the Whip-it handle looks as if it had been rubbed away after years of daily use. This was a brand new product. 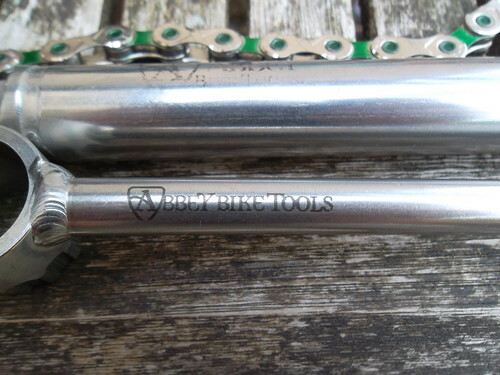 Abbey Bike Tools laser etching. These are relatively minor – and in the case of the laser etching merely cosmetic – quibbles that obviously don't detract from the performance of the Whip-It, but I feel I had to mention both concerns with such a premium product. Abbey Bike Tools Whip-It. The laser etching here is not the sharpest. As well as being a one-piece tool the key selling point for the Crombie is that there is no need to remove the quick release skewer from (most) rear wheels. My Crombie came with no instructions how to use it, but it is interesting to watch the Park Tool cassette replacement video (link if your device does not support embedded media). On my touring bike I have a Deore DX (Uniglide & Hyperglide compatible) seven-speed freehub body with an eight-from-nine HG50 cassette. My old tool barely engages with the lockring. I should probably use the technique shown in the video whereby the quick release skewer is passed through the lockring remover and acts as a retaining tool to hold the remover in place. The Crombie has sharper edges than my previous tool and does engage slightly better with that old freehub body. In fact, because the wording on the German web site was slightly ambiguous, I worried that I'd ordered the Campagnolo version; when it arrived I offered the Crombie up against a spare lockring and it didn't immediately slot in. Thankfully, the tool is simply built to very tight tolerances to give a reassuringly snug fit. My cassette removal tip: wrap the chain whip around the cassette first, letting it find its resting place after snaking about, then insert your removal tool at a suitable point to allow a secure position for undoing the cassette lockring. 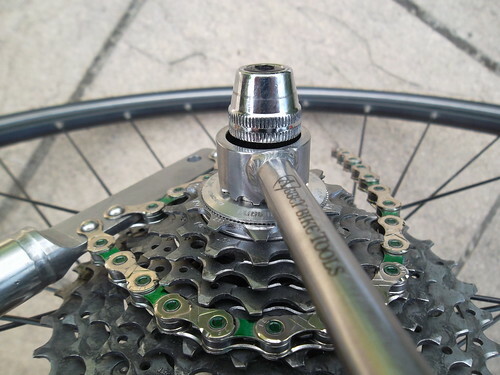 It is noticeable that the tool is not inserted particularly deeply in to the lockring of a road cassette – here a Shimano Ultegra 6700 cassette in combination with an eleven-speed 6800 wheelset freehub. This is not a fault of the tool, perhaps just an interesting characteristic of this particular road cassette and freehub. 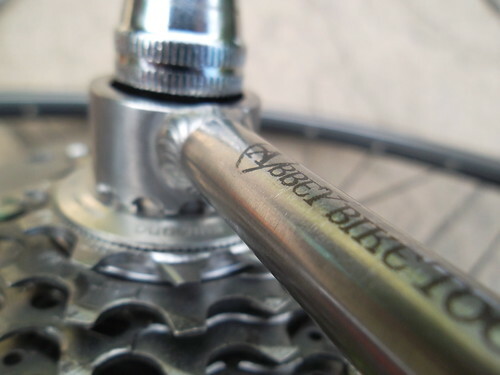 Note how much deeper the tool sits in the lockring of a Deore XT cassette. 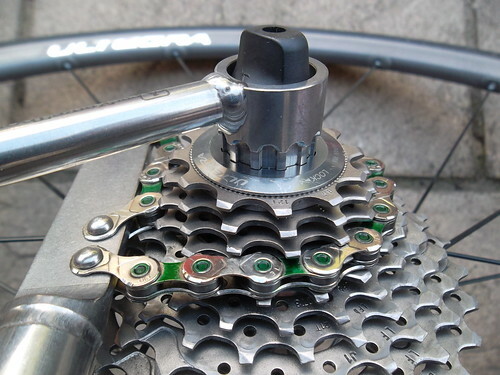 Here the mountain bike cassette is fitted to a Shimano 105 5700 road freehub body. The Crombie fits over all of the quick release skewer nuts on all of my wheels. If you have seen Toy Story 3 you will know all too well the plight of unwanted possessions. This lot pictured above have made their way to my surplus tools box. It's just a little harder to reach on a shelf of secondary importance. In combination with one decades-old chain whip I originally used the Cyclo lockring tool and the Cyclo pedal spanner/24mm wrench. 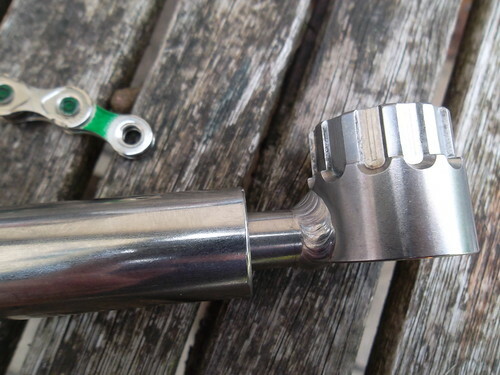 The 15mm pedal spanner jaws became worn, so it was soon obsolete and I replaced it with a PW-4 Park Tool pedal wrench. Then I bought a 24mm 1/2" drive socket and paired it with a sliding 1/2" drive T bar. Perhaps I should have gone with a shorter socket. Anyway, all those pictured above no longer have a place in my regular tool box. This is a very neat, space saving feature. The Crombie fits inside the Whip-It. The two tools are also remarkably light – although still lighter Crombie options are available. When the package containing the tools arrived I worried that something was missing so I opened the box before my birthday. No, really. I was surprised by just how relatively tiny the Crombie is. (My wife was not at all impressed.) I expected a thicker handle, but in operation the tool works perfectly well and has allowed me to remove all of my cassettes with confidence. The only advantage of my old removal tool is that it can be spun between finger and thumb to take up initial slack or to spin off once the lockring has been loosened. The compact nature of the two tools in combination mean that they fit snugly in to my tool roll. 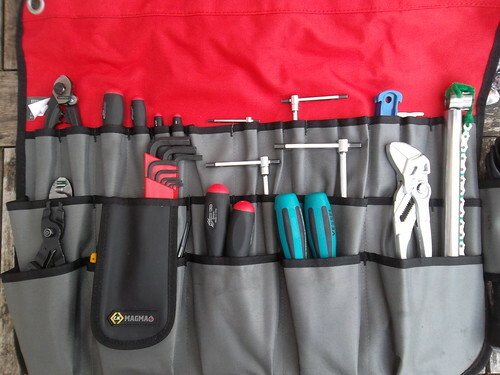 I don't have a wall board – I'm too fearful of my garage being burgled – so this is my way of having my tools tidy and is kept indoors within a large, but portable, toolbox. As an aside, I've spent far too much time on YouTube watching videos about what professional mechanics have in their toolboxes. Typically, theirs aren't the common or garden variety I have, rather some eye-wateringly expensive briefcase-style affair from Pelican or some such in to which foam slab inserts are invariably placed. Not since the days of Victorian birds' egg collectors have treasured possessions been displayed with such fetishistic reverence. Kaizen is the name of the go-to foam that is delicately cut out with a scalpel to house the travelling mechanic's expensive specialist kit. 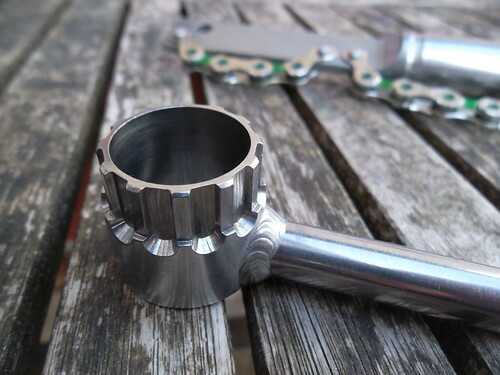 This standard single-sided Abbey Bike Tools Crombie works with SRAM lockrings as well as those on Shimano cassettes. There is a Campagnolo version, and a double-sided model that does all three. I have no Campagnolo equipped bikes so I chose the classic option. I think I made the right choice. Standard single sided models have a solid 3/8" inch shaft and the standard double-sided tool has a solid 1/2" inch shaft. The SL (Superlight) double-sided models have a hollow 1/2" inch handle. 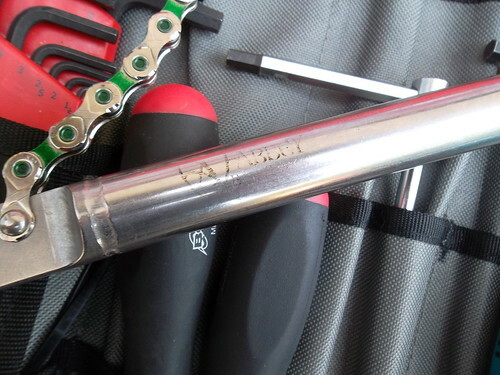 The Team Issue Crombie tools are single sided (Shimano/SRAM or Campagnolo) and also with a 1/2" inch hollow handle. There is also a thru axle model, or two. Got all that? There are only two versions of the Whip-It, really. Aside from the longer and stronger Track Chain Whip all that is different about the two variants of the standard Whip-It is the size of the 'plug' that is inserted for partnering up with Crombie tools of either 3/8" or 1/2" diameter handles. Overall, am I happy with the Crombie and Whip-It? Yes, those relatively minor quibbles aside. Although I have earned a bit of money working on bikes I know these tools won't pay for themselves, really. I'm not a jet-setting mechanic worrying about the weight of my luggage being stored in the aircraft's hold. I do, however, appreciate well-made tools that will last. 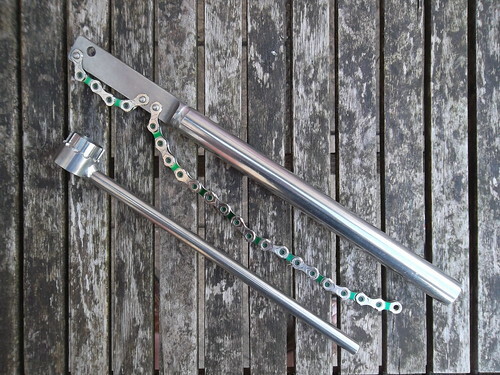 I could have taken down that old ten-speed KMC chain that has been hanging in a store room from a zip-tie for the past three years and made a DIY chain whip, but I never did. And even now that I've got two cassettes – one for the wheel used on the road, and one on the turbo training wheel – I believe I've made a sound purchase. Well, my wife has. Posted by Chris on August 12th, 2018. Very good Chris, and hardly a speck of dirt anywhere to be seen. Good photos too. Hi CHris. A good tool is an expense only if used once. When used regularly it becomes an investment whose cost-per-use diminishes each time you change cassettes. Congratulations to your wife on making a sound investment decision. Hi, Kern. 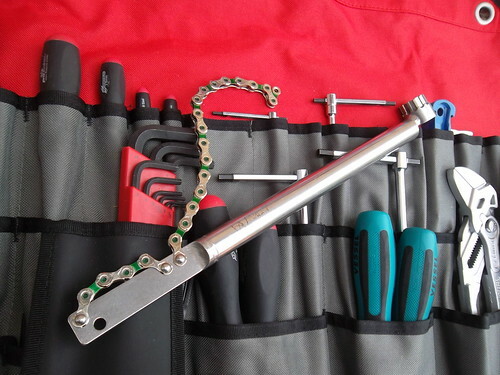 Yes, since I wrote this review Father Christmas brought me a rather nice Shimano chain tool (my old one had become bent) and it is a pleasure to use. Here's to sound investment decisions!